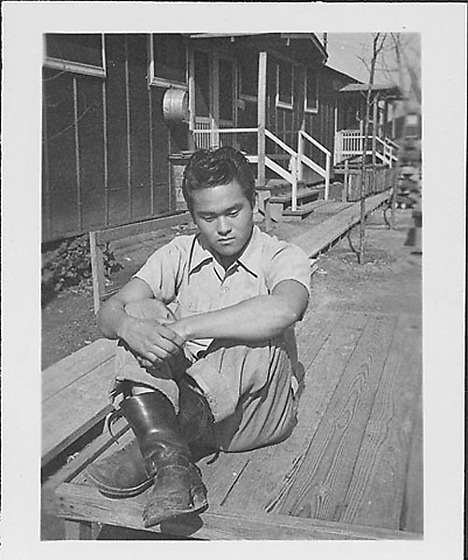 Young man sits with downcast eyes and hands clasped over knees drawn up on a wooden deck at Rohwer concentration camp, Rohwer, Arkansas, February 18, 1945. 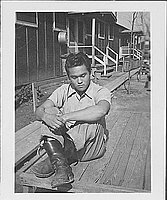 Dressed in jeans, shirt and leather boots, the young man sits at edge of deck in foreground. Boardwalk extends from BL to TR in front of barracks with tarpaper walls and white trim around windows. Stamped in black ink on back, BRC: FEB 18 1945.